There are 3 basic color "building blocks" in horses that are controlled at 2 genetic locations. The Extension locus determines whether or not black pigment is present. Black is dominant at this locus and red (chestnut) is recessive. 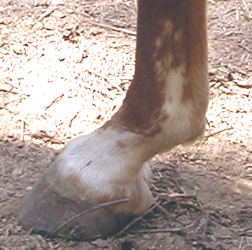 Horses will either be EE (homozygous black), Ee (heterozygous black) or ee (chestnut) at this locus. The second locus is the Agouti locus which determines whether black pigment, if present, will be expressed throughout the coat or restricted to the points (bay). 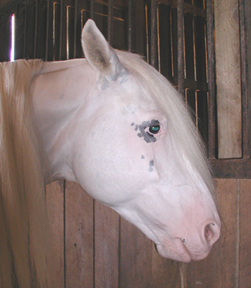 All dilutions (creme, champagne, silver dapple) and patterns of white (roan, gray, tobiano, sabino, frame, splashed white, appaloosa) act on these basic color building blocks. Then there are various shades that come from the action of sooty or pangare (mealy) modifications. Most geneticists believe that seal brown is probably the action of sooty on chestnut or pangere on black, though there is still some possibility that there is a separate gene for it. There is also some possibility that there may be a "jet black" in addition to a "fading black." There's still lots to learn, and most of it is still theoretical, but they have developed a DNA test to determine what the genetic make up of a particular horse is at the Extension locus. That test determined that our stallion Color Master is EE, or homozygous black, and our filly MeMe is Ee, or heterozygous black. 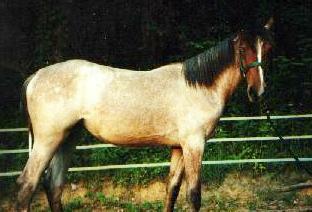 Both roan and sabino are patterns of white imposed on the horse's base color, but they are caused by two different genes. 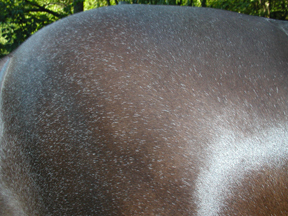 The roan gene causes white hairs to be mixed in with the base coat color on the body and neck. 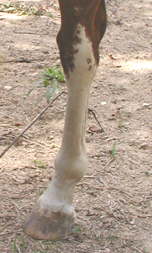 The head and legs remain the base color. Roans go through seasonal changes, with more white during the spring, somewhat less in the summer, even less in the fall, and less still in the winter. 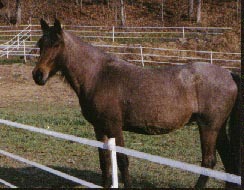 Sabino is one of several "spotting" genes. 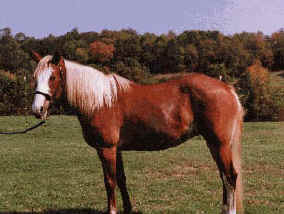 In the Paint breed, "spotted" horses are divided into two types, tobiano and overo. In recent years, however, it has been demonstrated that "overo" is actually made up of at least three separate genes: frame, splashed white and sabino. 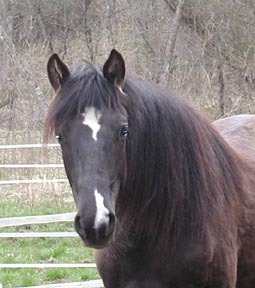 The Missouri Fox Trotting Horse Breed Association, like many breed registries, has followed the Paint definitions for spotted horses and so only recently recognized "sabino" as a pattern. Sabino is characterised by a wide blaze which may extend onto the lower lip, high white stockings which often have extensions above the knee and hock, white splashes, especially on the belly, and often by roaning of the coat. A lot of confusion has come from the fact that the sabino pattern can be minimally expressed (like our foal MeMe) with only a few white markings and some roaning, or maximally expressed as a medicine hat or even all white horse (like Color Master). In 2004 we were asked to participate in a study at the University of Kentucky hoping to isolate a gene or genes responsible for causing the sabino pattern. It was thought that maximum sabinos and their offspring could be especially helpful in the study. 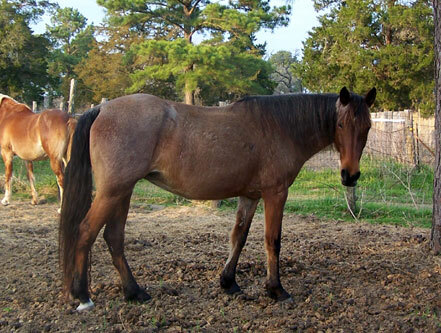 We sent in DNA samples from Color Master, our sabino mare Travelin' Tootsie, and their son Rhythm Master. The study did identify a gene, Sb1, which causes a sabino pattern, but it is thought to be one of many sabino patterns. Color Master tested as homozygous for Sb1, so all of his offspring will have a copy of Sb1 and will be at least minimla sabinos. As expected, Travelin' Tootsie tested as heterozygous for Sb1, meaning that she is sabino but has only one copy of the gene, and Rhythm Master also tested heterozygous for Sb1. 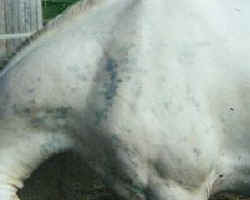 The study confirmed that horses that are homozygous for Sb1 will be white or nearly all white. Horses can have a copy of Sb1 and still be very minimal sabino. Since Color Master is homozygous for Sb1, that means that even his most minimally marked offspring are indeed genetically true sabinos. 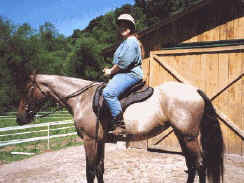 Our mare, Travelin Tootsie, is a "classic" sabino. Notice the speckling on her head, and how her blaze extends down onto her lower lip. She also has a small spot on her shoulder that is covered by her mane. The speckled, "lacy" appearance of her leg markings is also quite typical of sabino, and so is the way her stockings come to a point. Tootsie's registration papers identify her as a red roan, but she is clearly a sabino. Our stallion, Color Master, appears at first glance to be a white horse. However, his white color comes from the maximum expression of the sabino gene. 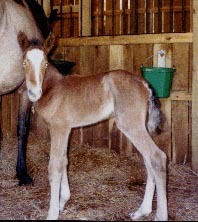 His sire is a black sabino and his dam is a bay sabino. If you look closely at Color Master, you can see that he has black spots on his otherwise pink skin around his eyes, on his ears, on his chest and flanks, under his tail, on the insides of his back legs, and on his belly. These spots have been getting darker and more numerous over the last year, and he's also getting a few black hairs over some of those spots and in his mane and tail. Color Me Tootsie, our filly by Color Master out of Travelin' Tootsie, is a very minimal sabino. She has only an unusually shaped star and snip, lots of roaning, and some small spots on her lower legs and lower jaw. The picture at far right shows the roaning on her rump. When Warrior's Yankee Lady had her first foal in 1999, we thought at first that the filly was a bay sabino, since her sire carries the sabino gene. 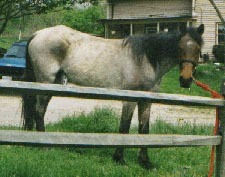 However, within the first few weeks of her life, the filly began to exhibit the seasonal color changes of a roan, and it became clear that she carries both genes.